Hornby Lighthouse stands tall at South Head, near Watsons Bay in Sydney Harbour National Park. 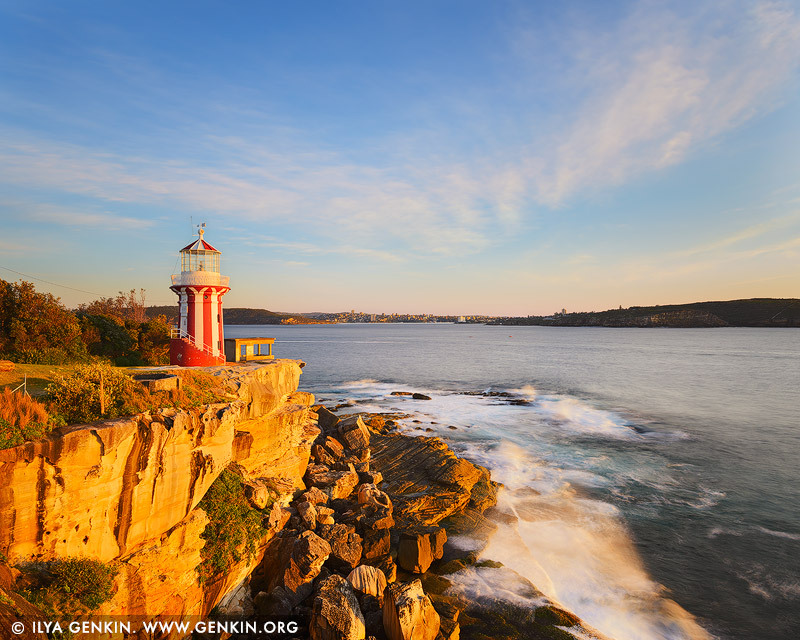 The iconic red and white striped tower is surrounded by magnificent views: Sydney Harbour to the west, Middle Head and North Head to the north, and the expansive Pacific Ocean to the east. The lighthouse was built in 1858 following the wrecking of the Dunbar at the foot of South Head. Designed by colonial architect Alexander Dawson, Hornby Lighthouse was the third lighthouse to be built in NSW. Hornby Lighthouse is accessible via the South Head heritage trail – an easy walk that leaves from Camp Cove at Watsons Bay, taking you past historic gun emplacements before reaching Hornby Lighthouse. This image id AU-HORNBY-LIGHTHOUSE-0003 of Hornby Lighthouse at Sunrise, is copyrighted © by Ilya Genkin. This is not a public domain image.